If you’re staying in a dorm room, chances are there are fire regulations you need to follow. One of those regulations probably prohibits covering your walls in loose-leaf. The only place I’m allowed to put up paper are on my cork boards, generously provided in every room by housing. Last year I had one ginormous one, but this year I’ve got two decent-sized ones. I’ve come up with different ways to use each one to best suit my needs. January 22, 2015 March 15, 2015 Categories bedroom, Decor2 Comments on Nightstands: What’s the Big Deal? Continue reading ➞ Nightstands: What’s the Big Deal? Closet Doors: Help or Hindrance? January 1, 2015 January 1, 2015 Categories bedroom, Decor2 Comments on Closet Doors: Help or Hindrance? As I’ve stated in past posts, my room isn’t as big as I’m used to. It’s not tiny, but it’s the smallest room in the house and I decided to squeeze a double bed into it. It was manageable, but uncomfortable. Continue reading ➞ Closet Doors: Help or Hindrance? You may have figured it out already: Thursdays are about Interior Decorating. My room happens to be the smallest bedroom in the house, but I chose it because it gets the most sun and the other two rooms had weird mint-coloured walls whereas mine are a light grey. The plan is pretty simple: A door, a window, and a closet. 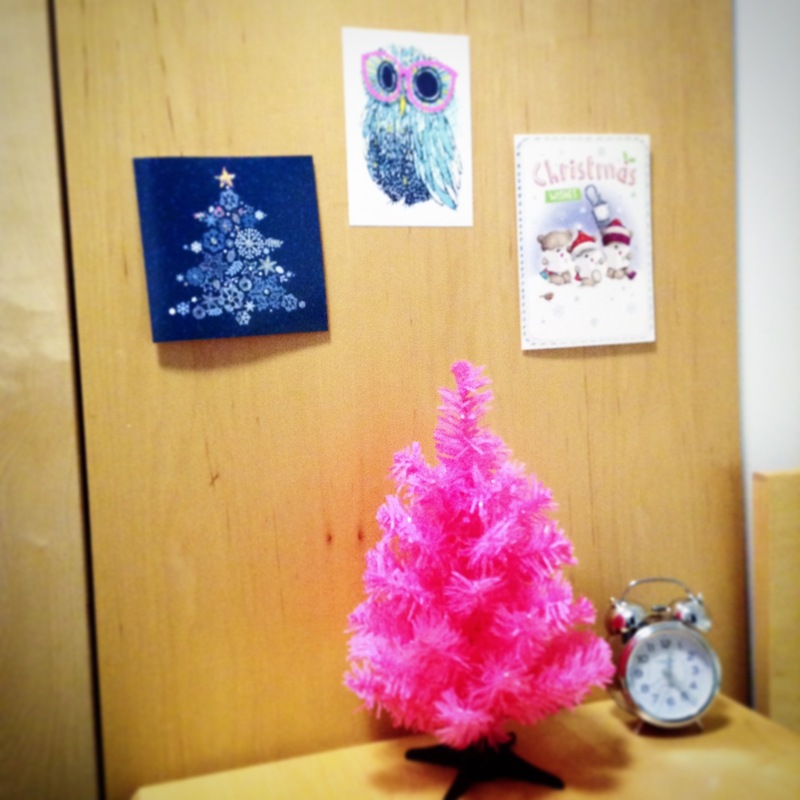 This pink Christmas tree is no more than twelve inches from the bottom to the tippy-top. For comparison, the owl is a standard 4×6 postcard. My dorm room is pretty standard. I have a fixed bed, desk, wardrobe, and shelves. I’m lucky enough to have a small en-suite and the building itself only opened last year so I am the second person to occupy this space. It’s about half the size of last year’s dorm, including the en-suite (last year’s had none). The desk doesn’t wobble and I can’t hear the footsteps of my neighbours, so I’d say it’s a good room. But when it comes to decorating, I have to think about a lot of things. All of my decorations need to be easily brought back to Canada with me. University housing has some sort of vendetta against blue tac, so I can’t use that. Too much paper on the walls will be considered a fire hazard and will get me in trouble. To top it all off, my room is really small. But I did not let any of that get in the way!